In the framework of EURIPIDES², a Franco-Swiss partnership has developed an atomic clock that would lose just a single second over 6 million years. A Franco-Finnish consortium developed a new generation of satellite technologies to deliver fast Internet to remote communities. Six publications and two patents* demonstrate the scientific quality of the research performed. French electronics group Thales headed a European consortium that worked out how to upgrade airplane satellite communications by developing a more sophisticated set of antennas. A team of engineers from French and German companies has come together to improve the safety of ships at sea with a solid-state, electrostatic compass that can find true North without ever needing maintenance or replacement. 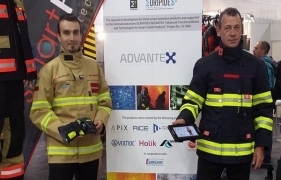 A smart jacket developed during the Czech-led research project EURIPIDES INTEX could soon help firefighters stay safer on the job and be on the market by 2016. With a Europe-wide publicly-funded effort of more than three years and a total investment of 8.1 million euro, automotive engineering giant Continental has revolutionised car engines, together with partners including PSA Peugeot Citroen and Daimler-Chrysler. The CERAMJET project was aimed at the main ceramic components and interconnection manufacturers in Europe, with the expectation of dramatic competitive advantages, using a rupture innovative technology. Targeted direct and immediate applications of the CERAMJET were: MLCCS (capacitors), fine-line thick-film circuitry.